Whether you are managing a busy office or a large organisation, it is extremely crucial for your staff to stay focused, and for your clients and customers to feel welcome. A clean and well-organised space will help in achieving these goals. At Sunshine Eco Cleaning Services, we have been providing a flexible, bespoke commercial cleaning service to our customers across Brisbane for over 12 years. Our flexible approach to office cleaning offers our customers professional services at appealing prices with assured quality. Sunshine Eco Cleaning Services has been providing a full suite of cleaning services to a wide range of commercial clients, from small offices and shop fronts to large multi-story buildings. Whether you need cleaning on a daily, weekly or monthly basis, we can help you with handling all sorts of cleaning chores. We are so versatile and our services can be scheduled around the time that is convenient for you. We work as a team to keep your commercial premises spotless and safe for your employees and customers. 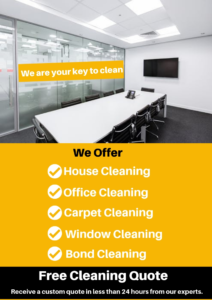 We also expertise in all types of commercial cleaning including building exterior, office staff rooms, reception area, kitchen, toilets, carpet cleaning, window cleaning and so on. Our service areas include Brisbane & all across Australia. Call 044 966 4277, Get a free quote! We are the best professional cleaners at your service. Have you been recently thinking that your office has become too dirty, and you should get it cleaned by a professional commercial cleaning company Brisbane offering office cleaning services in Brisbane? Congratulations! You have landed at the right place. Sunshine Eco Cleaning services provide professional commercial cleaning in Brisbane for all types of commercial properties like office, shop, factory etc. We have office cleaning experts to handle all kinds of messy situations. 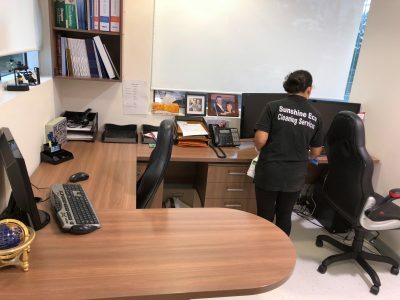 Brisbane office cleaning services provided by Sunshine Eco Cleaning Services cannot be matched by any other office cleaning company in the Brisbane city. We have experts along with the best equipment available in the cleaning industry. This allows us to provide you with flawless cleaning services for your office. To get the ideal services for commercial cleaning in Brisbane, hire Sunshine Eco Cleaning services. Why your office needs professional commercial cleaners, Brisbane? To clean the excess dirt from your office – Since you visit your office on a regular basis, it might not come to your notice that the office gets dirtier by the day. Dust settles every day without us even noticing it. While vacuuming does help, it does not do a proper job. Some dirt is always left out in the open without you even noticing it. Only experts from office cleaning companies in Brisbane can help you out with such a mess. To take the load off your shoulders by best office cleaners Brisbane – Owning the office and running it is quite a load on the shoulders as it is. If you add the burden of ensuring that your workplace is clean and tidy at all times, it acts as an unnecessary waste of time for you. To ensure that you avoid that, approaching office cleaning company Brisbane becomes necessary. To make a good impression with a clean office – Making sure that your customer is attracted to your services is essential for any type of business. No matter what service your office is offering, you need to have a clean and tidy outlook to your workplace to attract customers. It goes without saying that an unclean or smelly office can be a repellant for many customers. On the other hand, a clean and aromatic ambiance is always welcoming. Thus, regular office cleaning in Brisbane by experts is a must. To keep your staff healthy and productive with a clean office – A clean and healthy work area ensures that your staff feels comfortable. And, it can only be ensured with a leading commercial cleaning company like Sunshine Eco Cleaning Services in Brisbane. Having a clean workspace also eliminates the risk of a lot of health hazards. These factors have a direct effect on the productivity and output of your staff. To ensure that you get the maximum work out of your workers, it is desirable to have a clean and healthy office environment. Why is Sunshine Eco Cleaning Services better than any other commercial cleaning companies in Brisbane? The staff of expert commercial office cleaners in Brisbane – We have the most dedicated and skilled commercial cleaners in Brisbane. Our workmen are trained experts who know the best way to deal with the mess at your workplace. Once our experts are done with your office, it will look as good as new. The skills of our staff are unmatched by any other office cleaning companies in Brisbane. Decades of experience in commercial cleaning – We have been serving the Brisbane city for many decades now. You will get a highly personalized cleaning service experience form us. Commercial buildings are often large in size, making them tough to clean up. However, with our experience, we are able to provide the best commercial cleaning services in Brisbane city. Our office cleaning prices in Brisbane are right – Unlike other commercial cleaning companies in Brisbane, we have a fair and reasonable pricing policy. With us, you get the right price for all types of cleaning services. We provide customized services, which allow us to provide a reduced and reasonable price for the commercial cleaning Brisbane for your building. 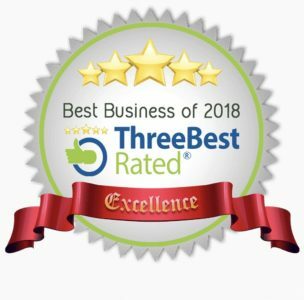 We use the right chemicals to clean your office – Unlike other commercial office cleaners in Brisbane, we use the safest washing agents and chemicals in our work. Our chemicals are non-toxic and biodegradable. 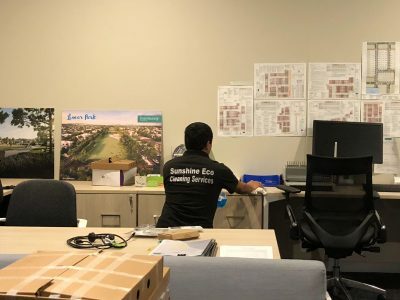 You can be completely sure of the safety at your workplace when you get office cleaning services Brisbane from Sunshine Eco Cleaning Services. We care about the environment and we care about our customers. Compliance with Commercial & Office Cleaning Industry Standards in Brisbane – We use chemicals that are compliant with the standards set by the cleaning industry. We use cleaning equipment and chemicals as regulated by the law. Our experts have properly trained office cleaners who are experts in their field. You can expect to get completely compliant commercial cleaning contractors in Brisbane when you hire Sunshine Eco Cleaning Services. Based on the above details, we will provide you with the ideal package for Commercial Cleaning Services Brisbane. Our office cleaning prices will be affordable and reasonable, and our services will be delightful. No matter how dirty or messy your office is, with our commercial pressure cleaning in Brisbane, we can take care of anything that bothers you. Instead of going for cheap office cleaning services in Brisbane, hire Sunshine Eco Cleaning Services, a leading office cleaning company in Brisbane. Hiring us is incredibly easy. Call us on our helpline number 0449664277 at any time you like. 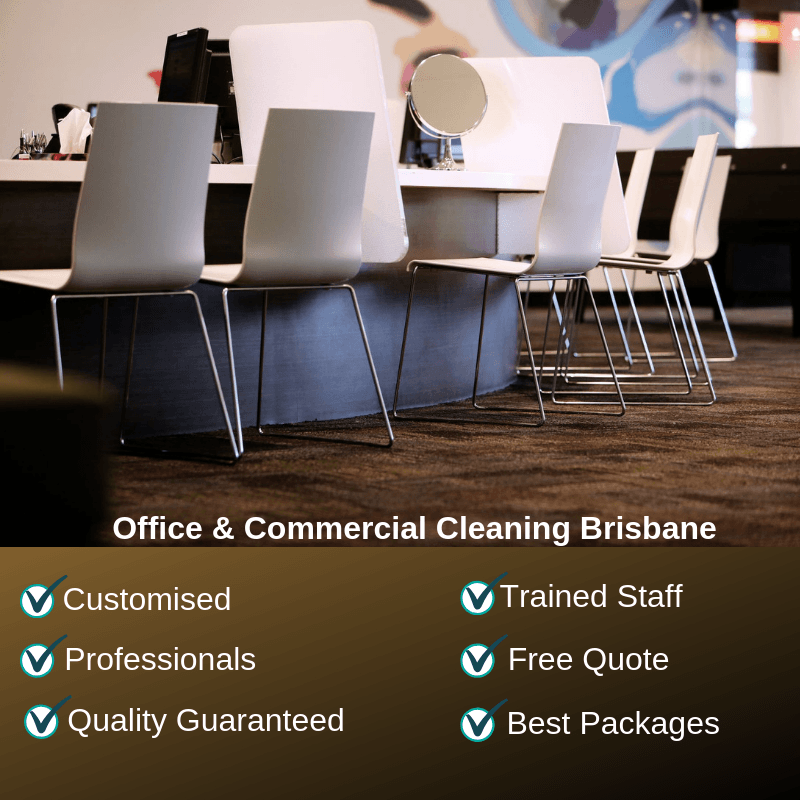 We will be happy to give you a free office cleaning quote Brisbane according to your needs. Any other queries will be answered as well. What Makes Us The Right Choice For Commercial Cleaning Brisbane? At Sunshine Eco’s friendly Services, we know how important it is to reduce our carbon footprint. That’s why we only use green products, and thereby minimising our impact on the environment and helping our clients be more eco-friendly too! Messed, cluttered and dirty workspace can be very distracting and challenging for the employees to work in. On the flip side, a clean and organised office environment increases the productivity of your employees. Hiring our commercial cleaners Brisbane will ensure that the workplace remains clean and healthy so that the work rate does not get hampered. Commercial cleaning is a time-consuming task. If it is not done by professionals, you will end up wasting a lot of time. Moreover, you will need to buy cleaning equipment and products that will add extra costs. Our professional cleaners bring all the tools and products with us and will get the cleaning job done without disturbing your business. Wiping and sanitizing phones and computer devices. The cleanliness of your commercial space helps in building your brand image and class. It is crucial for increasing the productivity of your staff and to save more time and money. Being affordable, reliable and above all, the best commercial cleaners in Brisbane, Sunshine Eco Cleaning Services can fulfill your commercial cleaning needs within your budget. For appointments, call 044 966 4277. Let us come to your place and evaluate your cleaning needs! Clean and tidy surrounding in office is imperative for the health and well-being of your employees. The main concern in office cleaning is to maintain the workplace clean and presentable to your clients. At Sunshine Eco Cleaning services, we have been providing effective and eco-friendly commercial cleaning services to our customers across Brisbane and surrounding suburbs. Eco-friendly cleaning is the best method of cleaning office buildings and premises and it denotes your concern for employee’s well-being. Green cleaning or Eco-friendly cleaning services not only benefits the health of your employees but also the environment. This will help you to have a healthy atmosphere and good air quality in your workspace. At Sunshine Eco Cleaning services, we use eco-friendly cleaning products to ensure your workplace free from the harmful contaminants and allergens. Usage of green products or eco-friendly products for cleaning will benefit your organization in the long run. Our cleaning experts scrub every side of floor leaving no stain visible. Our cleaners will make your workplace to smell fresh and free from any unpleasant odour. Our cleaning service will help you to restore the look and appearance of your office. Proper maintenance and cleaning of office premises promote a healthy environment in the workplace. Sunshine Eco Cleaning Services will provide you with complete commercial cleaning service for your office including building exterior, entrance, reception area, washrooms. We also provide customized packages in accordance with the customer’s expectation. We provide cleaning service to a wide range of clients, from small offices to larger commercial buildings in Brisbane. Is your office or commercial premises too messy and you are looking for effective, affordable & reliable cleaning services in Brisbane? Call 044 966 4277 today. Get a free quote! We have over 12 years of experience in delivering the best cleaning services for the residential, commercial or industrial property.